In 1972, Atari founder Nolan Bushnell invented Pong, a version of table tennis that, in many ways, launched the video-game industry. Forty-five years later, Bushnell is using that same simple game to test the waters for virtual-reality arcade gaming. Bushnell’s latest venture is a company called Modal VR, which is building its own wireless virtual-reality headsets and games that it plans to roll out in places like arcades, malls, and movie theaters in the coming months. On a recent Saturday in San Francisco, Bushnell—now a grizzled guy in his mid-70s sporting a Patagonia pullover and black Modal VR hat—sat quietly in the audience as a line of people of all ages shuffled through a classroom-size open space. In pairs, they donned a prototype bulky black headset and played Pong in virtual reality, running from side to side to control the game’s simple white paddles. It was fitting, considering “we’re at the Pong stage of VR,” Bushnell said with a smile. While several high-end headsets were released last year that can bring virtual-reality experiences to your living room, adoption of the technology is still in its earliest days for a bunch of reasons—it’s still bulky, expensive, and there isn’t all that much to do once you’ve got it on your face. More than two million headsets were shipped worldwide in 2016, according to an estimate from market researcher Canalys, but this figure pales in comparison to the popularity of, say, video game consoles (sales of the leading one, Sony’s PS4, topped six million during the 2016 holiday season alone). A demo video shows imagery from Modal VR’s Mythic Combat game. Consumer virtual reality will likely catch on as prices come down and headsets improve. In the meantime, though, a number of companies are betting that consumers may be happy to pay a much smaller amount to try the technology with their friends at, say, an arcade, theme park, or bowling alley. 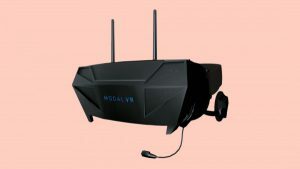 Modal VR says its technology lets up to 16 users explore virtual reality in large spaces—as big as 900,000 square feet, in theory, which would offer a lot more mobility than you typically have in VR these days—and it has built a headset and three games so far (it also plans to let developers make games for its platform). One is a fighting game called Mythic Combat and another, called Project Zenith, is a first-person shooter game set in outer space. Pong is not meant to be one of its offerings—it was originally put together as a joke, in homage to Bushnell’s past—but the company decided to use the simple two-player game anyway to demonstrate what it’s working on at the World’s Fair Nano technology fair in San Francisco in late January. Jason Crawford, the company’s founder (he piqued the interest of Bushnell, who is listed as a cofounder), says its headset is meant to be rugged enough for 11-year-olds to beat the hell out of at arcades. It doesn’t need to be tethered to a computer, and can be used to play games with other people who are right there with you, he says, though he declined to share specifics on the technologies behind it. Carly Kocurek, an assistant professor at the Illinois Institute of Technology who studies video gaming and its history, agrees that for many people it makes sense to try virtual reality out in a more arcade-like setting, especially since it could come with instructions on how to use the technology. One problem she foresees, however, is that people often become a spectacle for others when they’re wearing VR headsets—something she noticed on a recent trip to Las Vegas where she walked by headset-clad folks in the midst of a virtual-reality experience. VR Pong players Nirav Doctor and his 10-year-old son, Sur, didn’t seem to mind, though. They were among those who took a turn running blindly from side to side in an area about the size of a classroom, acting as human paddles hitting a virtual cube back and forth while a small crowd watched their gameplay on a display overhead. The game was only about two minutes, and the graphics were not much more advanced than on the original Pong, but both came away impressed. Sur, who won, liked that he had to move around a lot to keep scoring; Nirav said it was fun to play with his son. Would they be willing to pay for something like this, though?